Zombie fans and gamers alike got some good news recently: the often talked about film adaptation of the popular video game Dead Island has, well, it’s come back from the dead. It’s been some time since we heard even a peep from the project, but Deadline reports that the film version of the wildly popular video game could hit theaters as early as next year. 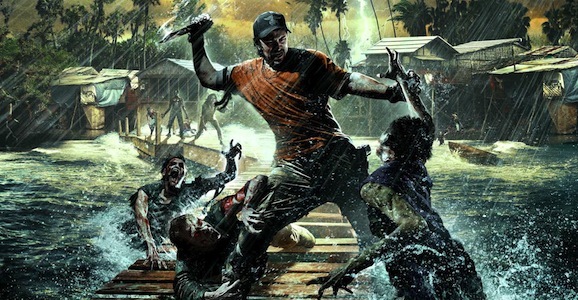 Dead Island first appeared in 2011, and now Occupant Entertainment has teamed up with publisher Deep Silver to finance and produce the picture. AMC’s The Walking Dead always has a strong presence at San Diego Comic-Con, and this year was no different. The smash hit zombie drama revealed a new trailer and that the first six minutes of the season five premiere are apparently going to be totally bananas. But there is a lot more waiting for fans when the show returns on Sunday, October 12. We weren’t at Comic-Con this year, we’re afraid of crowds and bright colors, but our dear friends at Cinema Blend aren’t the scaredy-cats that we are, and we all over the massive nerd gathering. 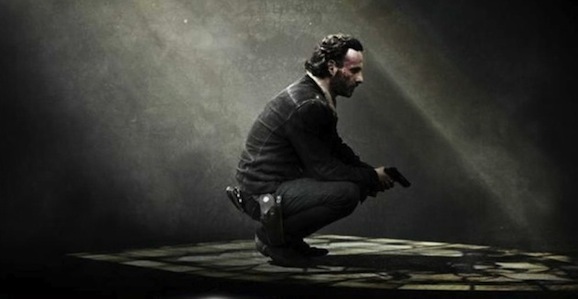 They got the opportunity to sit down at roundtables with some of the writers and producers of The Walking Dead, and were able to gather some insight into the upcoming season, as well as some news on the long-gestating spin off. Season four of AMC’s The Walking Dead was far and away the best the zombie drama has ever been, especially the final eight episodes. Between that momentum, and the grim, intense trailer for season five that debuted at San Diego Comic-Con over the weekend, it’s a good time to be a fan. 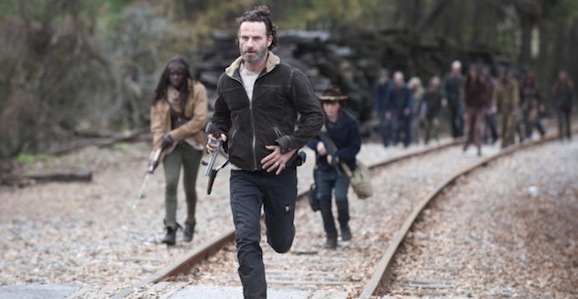 Last season ended on a cliffhanger, and we’ve been promised time and again that the new episodes will “hit the ground running.” Now thanks to showrunner Scott Gimple, director/producer/special effects guru Greg Nicotero, and some of the cast, we have a better idea of what that “running” will look like, and it is going to be rough. San Diego Comic-Con is like a magical wonderland for people like crowds, waiting in long lines, and getting the first look at upcoming movies and television shows. And probably comics, somewhere. Because it has a foot in both worlds, The Walking Dead has always used the platform of Comic-Con to reveal news and footage, and this year is no different, as AMC’s hit zombie series revealed this lengthy new trailer, as well as a premiere date for season five. There may be some light SPOILERS for Walking Dead fans beyond this point. And some swear words. That massive spectacle that San Diego Comic-Con has become kicks off in earnest today with tons of high-profile upcoming movies and television shows stopping by to show off their wares. Being based on an actual comic book, AMC’s hit zombie drama The Walking Dead has always had a strong presence, and this year isn’t going to be any different. The show took over a portion of “America’s Finest City” to give fans a slice the post-apocalyptic zombie excitement. 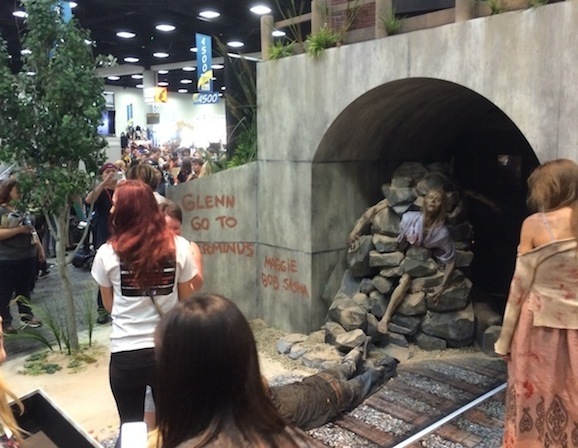 We aren’t lucky, or driven enough to be at Comic-Con this year (we’re afraid of large crowds), but our fabulous older sibling Cinema Blend is all over the place, and they were able so snap these photos of the badass Walking Dead display. Fans who watched season four of Rick Grimes (Andrew Lincoln) and company trying to make their way through the zombie-filled world will recognize these big set pieces.